With increasing need for parallelization of Machine Learning algorithms, because of exponential increase in data sizes and even model sizes, it would have been really helpful if we had a tool which could help us parallelize our Pandas‘s DataFrame handling, which could parallilize our Numpy‘s computations, and even parallelize our Machine Learning algorithms (maybe algorithms from sklearn and tensorflow), efficiently, effectively and without much hassle. But such a library does exist, and its name is Dask. Dask is a parallel computing library which doesn’t just help parallelize existing Machine Learning tools ( Pandas andNumpy)[i.e. using High Level Collection], but also helps parallelize low level tasks/functions and can handle complex interactions between these functions by making a tasks’ graph.[i.e. using Low Level Schedulers] This is similar to Threading or multiprocessing modules of Python. They also have a separate Machine Learning library, dask-ml, which has integration with existing libraries such as sklearn, xgboost and tensorflow. 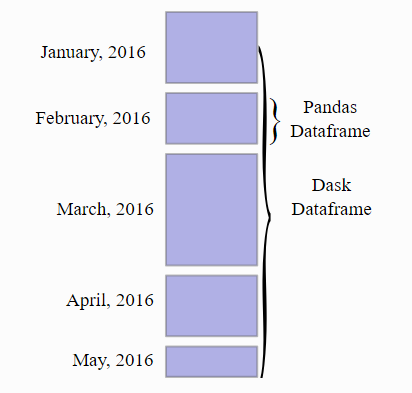 Dask parallelizes tasks given to it by making a graph of interactions between the tasks. It will be really helpful to visualize what you are doing by using Dask‘s .visualize() method which is available with all of its data types and with complex chain of tasks you compute. This method will output a graph of your tasks, and if your tasks have many nodes at each level(i.e. your tasks chain structure have many independent tasks at many levels, such as parallelizable task on chunks of data), then Dask will be able to parallelize them. Each data type in Dask provides a distributed version of existing data types, such as DataFrame from Pandas, ndarray‘s from numpy, and list from Python. These data types can be larger than your memory, Dask will run computations on your data parallel(y) in Blocked manner. Blocked in the sense that they perform large computations by performing many small computations, i.e. 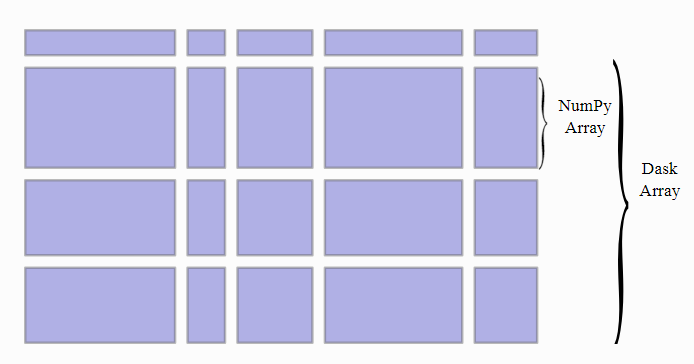 in blocks, and number of blocks are total number of chunks. Dask Array operates on very large arrays, by dividing them into chunks and executing those blocks parallely. It has many of numpy methods available which you can use to get speedup. But some of them are not implemented. Dask Array can read from any array like structure given it supports numpy like slicing and has .shape property by using dask.array.from_array method. It can also read from .npy and .zarr files. It can be used when your arrays are really heavy (i.e. they won’t fit into memory) and numpy won’t be able to do anything about that. So, Dask divides them into chunks of arrays and operate on them in parallel for you. Now, Dask does lazy evaluation of every method. So, to actually compute the value of a function, you have to use .compute() method. It will compute the result parallely in blocks, parallelizing every independent task at that time. Similar to Dask Arrays, Dask DataFrames parallelize computation on very large Data Files, which won’t fit on memory, by dividing files into chunks and computing functions to those blocks parallely. Now you can apply/use most of the functions available in pandas library and apply it here. Dask Bags parallelizes computation on Python‘s list like objects which contains elements of many data types. It is useful when you are trying to process some semi-structured data like JSON blobs or log files. Dask bags reads line by line and .take method outputs tuple of number of lines specified. Dask Bag implements operations like map, filter, fold, and groupby on such collections of Python objects. It does this in parallel with a small memory footprint using Python iterators. It is similar to a parallel version of PyToolz or a Pythonic version of the PySpark RDD. If your task is a little simple and you are not able to or don’t want to do that with these High Level Collections, then you can use Low Level Schedulers which help you to parallelize your code/algorithm using dask.delayed interface. dask.delayed also does lazy computation. You can add complex interactions between these functions according to your needs using results from previous tasks as an argument to next ones. Dask will not compute these functions right away, rather it will make a graph for your tasks, effectively incorporating interactions between functions that you use. You can add delay to any parallelizable code with many possible small blocks and get a speedup. It can be many functions you want to compute like in example above or maybe reading a number of files in parallel using pandas.read_csv. Firstly, until now we have using Dask‘s default Scheduler for computing results of our tasks. But you can change them according to your needs from the options available from Dask. Threaded tasks will work well when the functions called release the GIL, whereas multiprocessing will always have a slower start-up time and suffer where a lot of communication is required between tasks. # last one for "single-threaded"
It handles data locality with more sophistication, and so can be more efficient than the multiprocessing scheduler on workloads that require multiple processes. You can create Dask‘s dask.distributed Scheduler by importing and creating a Client. # diagnostic dashboard if you have Bokeh installed. Now you can submit your tasks to this cluster by using client.submit method, giving function and arguments as its parameters. And then we can gather our result by either using client.gather or .result method. You can also look at progress of your task in current cell only by using dask.distributed.progress. And you can also explicitly opt to wait for a task to complete by using dask.distributed.wait. Dask also has library which helps in running most popular Machine Learning libraries in parallel, like sklearn, tensorflow and xgboost. Large Models: Data fits in RAM, but training takes too long. Many hyperparameter combinations, a large ensemble of many models, etc. Large Datasets: Data is larger than RAM, and sampling isn’t an option. For large datasets, use dask_ml estimators. dask_ml.preprocessing contains some of the functions from sklearn like RobustScalar, StandardScalar, LabelEncoder, OneHotEncoder, PolynomialFeatures etc., and some of its own such as Categorizer, DummyEncoder, OrdinalEncoder etc. You can use them as you have been using them with Pandas‘s DataFrame. And you can make a pipeline from sklearn‘s make_pipeline method using preprocessing methods of Dask on Dask‘s DataFrame. Dask has methods from sklearn for hyperparameter search such as GridSearchCV, RandomizedSearchCV etc. And if you are using partial_fit with your estimators, you can use dask-ml‘s IncrementalSearchCV. If you want to use post-fit tasks like scoring and prediction, then underlying estimators scoring method is used. If your estimator, possibly from sklearn is not able to handle large dataset, then wrap your estimator around "dask_ml.wrappers.ParallelPostFit". It can parallelize methods like "predict", "predict_proba", "transform" etc. Dask has some of the Linear Models (LinearRegression, LogisticRegression etc. ), some Clustering Models ( Kmeans and SpectralClustering), a method to operate with Tensorflow clusters, methods to train XGBoost models using Dask. You can use sklearn‘s models with Dask, if your training data is small, maybe with with ParallelPostFit wrapper (if your test data is large). If your dataset is not large but your model is big, then you can use joblib. Many sklearns algorithms were written for parallel execution (you might have used n_jobs=-1 argument), using joblib which makes use of threads and processes to parallelize workload. To use Dask to parallelize you can create a Client (you have to) and then wrap your code around with joblib.parallel_backend('dask'):. Note that the Dask joblib backend is useful for scaling out CPU-bound workloads; workloads with datasets that fit in RAM, but have many individual operations that can be done in parallel. To scale out to RAM-bound workloads (larger-than-memory datasets) you should use Dask's inbuilt models and methods. And if you training data is too big which cannot fit into memory, then you should use Dask‘s inbuilt estimators to get a speedup. You can also use Dask‘s wrapper.Incremental which uses underlying estimator’s partial_fit method to train on whole dataset but it is sequential in nature. Dask‘s inbuilt estimators scale well for large datasets with variety of optimization algorithms like admm, lbfgs, gradient_descent etc. and with regularizers like L1, L2, ElasticNet etc.